West Ham Utd have been undefeated in their last 4 away matches in Premier League. Southampton conceded at least 1 goal in each of their last 8 matches in Premier League. 33% of West Ham Utd’s conceded goals occurred after the 75th minute in Premier League. Southampton conceded at least 1 goal in 75% of their home matches in Premier League. West Ham Utd have scored in 75% of their away matches in Premier League. 47% of Lokeren’s conceded goals occurred after the 75th minute in Jupiler League. 75% of Club Brugge’s matches had over 2.5 goals scored in Jupiler League. Beveren have scored 2 goals or more in each of their last 3 matches in Jupiler League. 79% of Lokeren’s conceded goals occured in the second half in Jupiler League. 66% of Club Brugge’s points have been earned at home in Jupiler League. 86% of Lokeren’s points have been earned at home in Jupiler League. 36% of Club Brugge’s conceded goals occurred after the 75th minute in Jupiler League. 83% of Beveren’s goals have been scored in the second half in Jupiler League. Lokeren have scored 2 goals or more in each of their last 4 home matches in Jupiler League. Club Brugge have scored in 90% of their away matches in Jupiler League. Beveren have scored 43% of their goals after the 75th minute in Jupiler League. 71% of Pescara’s goals have been scored in the second half in Serie B. 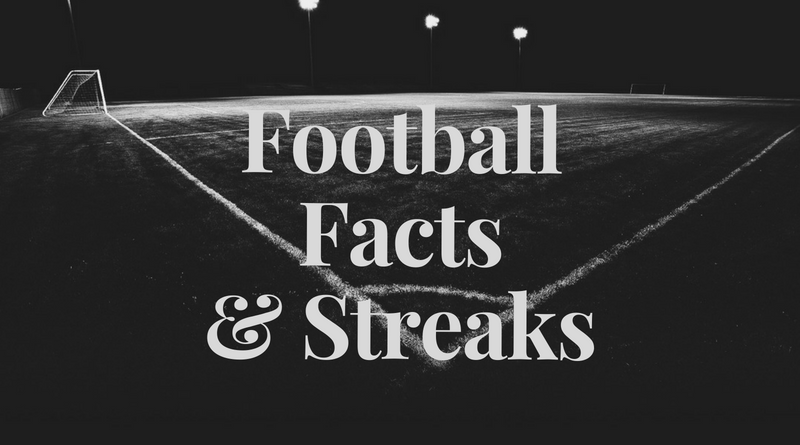 75% of Venezia’s matches had under 2.5 goals in Serie B.
Crotone conceded at least 1 goal in each of their last 13 matches in Serie B.
Pescara conceded at least 1 goal in 75% of their home matches in Serie B.
Cosenza conceded at least 1 goal in 86% of their home matches in Serie B. 84% of Salernitana’s goals have been scored in the second half in Serie B.
Salernitana have scored 37% of their goals after the 75th minute in Serie B.
Crotone have failed to win in their last 8 matches in Serie B.
Venezia have scored in 75% of their away matches in Serie B.
Foggia have scored 75% of their goals at home in Serie B.
Venezia have scored in each of their last 5 away matches in Serie B. 69% of Cosenza’s matches had under 2.5 goals in Serie B.
Cosenza have scored 36% of their goals after the 75th minute in Serie B. 87% of Salernitana’s points have been earned at home in Serie B.
Crotone have scored 33% of their goals after the 75th minute in Serie B. 77% of Spezia’s points have been earned at home in Serie B.
Crotone conceded at least 1 goal in each of their last 8 home matches in Serie B.
Spezia have scored 71% of their goals at home in Serie B.
Crotone have conceded the opening goal in 75% of their matches in Serie B. 79% of Spezia’s conceded goals occured in the first half in Serie B. 80% of Crotone’s goals have been scored in the second half in Serie B.
Perugia conceded at least 1 goal in 71% of their home matches in Serie B.
Crotone have scored 80% of their goals at home in Serie B. 70% of Perugia’s points have been earned at home in Serie B. 77% of Crotone’s points have been earned at home in Serie B. 75% of Foggia’s points have been earned at home in Serie B.
Crotone conceded at least 1 goal in 100% of their home matches in Serie B. 73% of Pescara’s points have been earned at home in Serie B.